Five years ago, the spacious lobby of the Hotel Oakland was an echo chamber. A century ago the hotel was one of the nation’s most illustrious. Then the Great Depression crippled the majestic site, which became a military hospital during World War II. Located just outside Chinatown in Oakland, it eventually became affordable housing for Asian elders who spent most of their days home alone. “It was a no-man’s land,” recalls Bill Langelier, owner of Hotel Oakland. Spurred by the experiences of his mother in four different long-term care facilities – “all of them woefully inadequate” — Langelier had an idea. He decided to transform the Hotel Oakland from a simple housing complex into a haven for health and social connection. Today called the Hotel Oakland Village – in alliance with the country’s blossoming village movement – the senior living site features 15 Health Groups that include exercise, healthy eating, gardening, personal safety, healthy minds, and the immensely popular Neighbors Helping Neighbors. Some residents have joined them all. Today, the lobby is the village’s social hub. It hosts meetings, exercise and dance classes, holiday festivals, health fairs, Mah Jongg games, poker, chess, bingo and a Saturday movie. 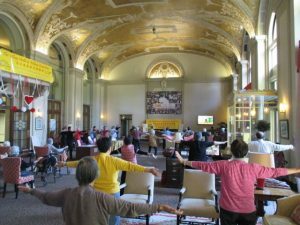 Each month there are 80 different events, all of which end with the village mantra: “Participation equals good health.” Of its 400 residents, 80% participate in at least one of the groups. Langelier’s goal was to mitigate the devastating health effects of social isolation — and today’s “epidemic of loneliness” — by putting older adults in charge of their own health. “The intersection of those two produced results that were successful beyond our wildest imagination,” he says. Four years ago, Sui Fong Ho’s father died from complications of diabetes. Shocked, his wife’s high blood pressured spiked; she died an hour later. Devastated by the loss of both parents on the same day, Ho slipped into an intense depression, unable to eat or sleep. She cried all the time. But Ho then found the Health Groups, and her recovery began. She first joined the computer and exercise groups. Then karaoke. Then gardening. Everyone in her family — brothers, sisters, children — saw her getting better. By the end of 2014 her depression was gone. Since most Hotel Oakland Village residents are California’s most expensive citizens – part of the state’s 1.1 million “dual eligibles” who receive support from Medicare (since they are over 65) and Medi-Cal (because they are poor) – improving their health means cost savings for both the state and the U.S. government. “The five-year experience we’ve had mitigating isolation through the Health Groups is ample evidence that it’s one of the most cost effective and important aspects of senior health that’s not being given its weight,” says Langelier. Langelier and his staff laud wellness director Nancy Lu for the program’s success. Lu brought her language skills — she converses with the mostly Chinese residents in both Cantonese and Mandarin — and her deep compassion. When Langelier asked Lu to head the Health Groups, she was at first skeptical. Could she lead the transformation of an entire housing complex? A marketing program was launched. The outreach transformed Neighbors Helping Neighbors from just eight members to a whopping 160. It has since established a buddy system to check in with other members, especially those who may be sick or lonely. Key to the success of the Health Groups, says Lu, are the resident leaders. And while Lu offers kudos to others, they point an appreciative finger back. And residents have flourished. Falls have reduced. Emergency room visits have dropped. And social isolation has largely been eliminated. “They getting healthier and healthier and happier and happier,” smiles Lu. Ting Kung Hsiaolan is one of them. A pianist for the choir [watch her video] who also plays one night a week in the lobby, she recalls the days of the empty lobby. Hotel Oakland Village also benefits from the proximity of two other resources: a pair of adult day health care sites serving the Asian community, one of them also a Community Based Health Home. Both are located just steps from the lobby in the hotel’s former dining room and ballroom. At the Hong Fook adult day health care site operated by Family Bridges, 77 village residents spend part of their week socializing and receiving needed care from health professionals including physical therapists, social workers, registered nurses and dietitians. Residents receive health screenings, a weekly nursing consultation, and advice on medications, rehabilitation, recreation, and nutrition. The Community Based Health Home uses an additional “nurse navigator” to serve 35 of these residents by visiting them at their home, in doctor’s offices or at the hospital. Launched in February, the Village Wellness Connection super sizes the Health Groups by placing Hotel Oakland Village at the epicenter of residents’ health needs. Since most have a variety of physicians and specialists — who often don’t communicate effectively — Lu works with the nurse navigator to collect health information that is then placed into an electronic medical record. This health information can then be shared with select family, friends, physicians and caregivers. The Village Wellness Connection currently has 95% participation. Langelier sees Hotel Oakland Village as a cost-effective solution to rising costs for the aging. His eventual goal: promote the adoption of Health Groups and the Wellness Connection around the country. Langelier and Jochimsen say the key to future success — even in a multi-ethnic community — is trusted leadership. “The importance of trust and love and care that Nancy has is a real key component to us,” says Jochimsen. With Ting’s husband is now in a nursing home, she visits Lu’s wellness office every day for friendship and camaraderie.